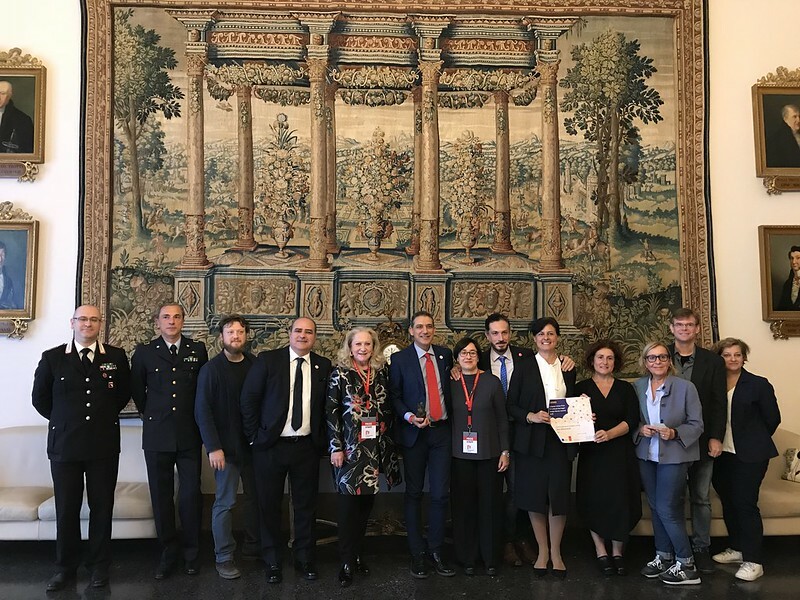 The success of the Open Monuments initiative in the EU Prize for Cultural Heritage / Europa Nostra Awards 2018 was celebrated on 13-14 October in Ferrara, Italy. 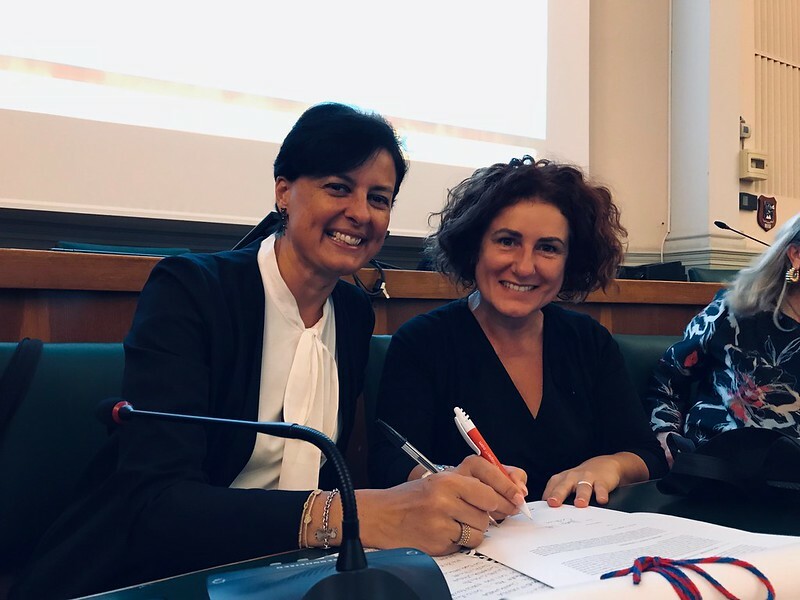 The Award in the category Education, Training and Awareness-Raising was presented to the representatives of the Imago Mundi Association, which has coordinated Open Monuments since its launch in 1997, at a ceremony held at the Ferrara Town Hall in the morning of 13 October. Europa Nostra was represented by its Board Member Rossana Bettinelli. The two-day programme included guided visits of various monuments in Ferrara by young volunteers who shared their great appreciation of cultural heritage with the participants. Open Monuments promotes smaller, lesser-known, heritage sites which may be in need of care, along with those larger, better known sites. It likewise raises awareness of the value of heritage in the social and economic development of communities. Some 130 municipalities take part in the initiative. The number of volunteers and sites collaborating with the Imago Mundi Association is equally impressive – starting with 500 volunteers and 40 participating cultural sites, Open Monuments now counts on the support of 18,000 volunteers and more than 800 cultural sites which are opened to the public for free. 200 schools are also involved in the initiative. “Open Monuments has a strong focus on the European aspect of heritage with many collaborative projects taking place. Participants in the tours can therefore understand their local heritage in a wider European context and from the viewpoint of other Europeans. The spirit of Open Monuments is therefore fully in line with the objectives of the European Year of Cultural Heritage 2018. It is a tremendous honour for our organisation to receive the European Union Prize for Cultural Heritage / Europa Nostra Award during this special Year,” stated Fabrizio Frongia, President of the Imago Mundi Association. During the ceremony, the participants were invited to sign the Berlin Call to Action: “Cultural Heritage for the Future of Europe”, which calls on the EU institutions to fully recognise cultural heritage as a priority for future European policies and funding as a means to build a more inclusive, cohesive and just Europe. Heritage professionals, volunteers and enthusiasts participated in the ceremony. In attendance were also Massimo Maisto, Vice-Mayor of Ferrara, Cristina Corazzari, Councilor for Education of the Municipality of Ferrara, Marzia Cilloccu, Councilor for Tourism of the Municipality of Cagliari, Marco Sgarbi from the Ferrara Cultural Association Off, Ingrid Veneroso from the Association of Italian Heritage of UNESCO, Luigi Dal Cin, Coordinator of Educational Projects, Roberto Calari, President of CulTurMedia Legacoop, and Pierluigi Vaccaneo, Director of the Cesare Pavese Foundation of Santo Stefano Belbo.